We’d love your help. 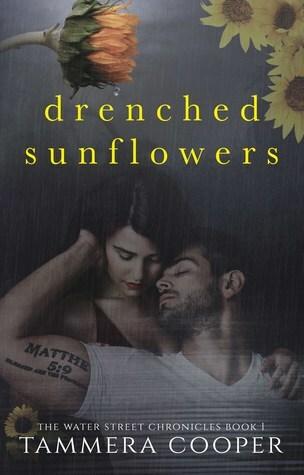 Let us know what’s wrong with this preview of Drenched Sunflowers by Tammera L. Cooper. Rainy days and river views fill Beth's summer as she makes a new start in small town Washington, North Carolina. After the loss of her husband in a tragic accident, simple seems better. It's time to renovate her life, starting with a future art gallery on the river. Sam, her contractor, has everything under control, but the stress of the construction project and new business is beginning to make her crazy. Nightmares and visions of ghosts become the nightly norm. She doesn't have time for this. She doesn't have time for her heart to make room for him. Sam is happy filling his days and nights with work. His two jobs as a teacher and contractor are his passions and do not leave room for much else. This new project has possibilities: a beautiful owner, the history of the house, and an 18th century diary. Beth's dream is becoming a timely reality until she disappears. Mystery and intrigue fill the haunting river bank of the Pamlico as Sam and Beth find the truth behind the Water Street house and each other. To ask other readers questions about Drenched Sunflowers, please sign up. I loved this story the romance was cute and slow the way romance really is, usually. Basically Beth loses her husband in an accident, so she moves to a small town where she can cut cost on starting an art gallery. She buys an old historical house and some artifacts and a diary are found. She has dreams of the girl in the dairy, who drowns, she keeps trying to rescue her, and it messes with her waking hours. She ends up dating Sam her contractor, and ends up kidnapped. A wonderful debut that will leave readers eagerly anticipating the next in the series. Part romance, part paranormal, and part mystery, it is ALL Southern charm. This one had me putting off my to-do list so that I could finish it! Drenched Sunflowers, a title that was my first draw in to this story...and though it seems like it should be melancholy and depressing, I found it to be refreshing and unique. Loved this book very much. It had just enough sweet romance and the storyline was great! I highly recommend! I started this book thinking it was a nice light romance, as others I enjoy reading. Then things started to twist, and I’m still processing what I think will happen in the next book! Looking forward to it! Romance, mystery and history - a great combination. I always enjoy a good Southern fiction novel and this one fit the bill. the characters were well written - flaws and all - and there was a bit of mystery in the plot. My only disappointment (and this was my fault) is that I didn't realize that this was a series and expected everything to be wrapped up at the end but now I have a reason to pre-order the next book in the series Sleeping Mallows in the spring, 2019. Beth is starting her life over in the small town of Washington, NC. Her husband had I always enjoy a good Southern fiction novel and this one fit the bill. the characters were well written - flaws and all - and there was a bit of mystery in the plot. My only disappointment (and this was my fault) is that I didn't realize that this was a series and expected everything to be wrapped up at the end but now I have a reason to pre-order the next book in the series Sleeping Mallows in the spring, 2019. Beth is starting her life over in the small town of Washington, NC. Her husband had died tragically a few years earlier in a drowning accident out West and she wanted a completely new start. She was having an old building renovated with plans for an art museum selling high quality art work plus her home. Her contractor, Sam was also a history professor at the local college and had a passion for both jobs. Beth has started having dreams about a young black girl and when Sam discovers a diary, they are both eager to try to find the reasons for the dreams that are causing Beth so much heartache. As the relationship between Beth and Sam deepens, there are other sinister forces in town trying to stop the plans for her business. i normally don't like books with a supernatural element in them but this was well done as part of the story line. I'm anxious to read the next book in the series for the continuation of the Sam and Beth romance as well as the mystery behind Beth's dreams. I honestly couldn’t get through Drenched Sunflowers by Tammy Cooper. I can’t NOT finish a book, but this one I truly couldn’t do it. From the dialogue between the two main characters, to the language being to stiff at parts, I couldn’t finish it. The story felt very predictable and the twists were absolutely no surprise for me either. I thought this had so much potential, but Cooper’s book really fell flat. I eventually put this book down and walked away after the numerous spelling and grammatic I honestly couldn’t get through Drenched Sunflowers by Tammy Cooper. I can’t NOT finish a book, but this one I truly couldn’t do it. From the dialogue between the two main characters, to the language being to stiff at parts, I couldn’t finish it. The story felt very predictable and the twists were absolutely no surprise for me either. I thought this had so much potential, but Cooper’s book really fell flat. I eventually put this book down and walked away after the numerous spelling and grammatical errors surfaced throughout the book. I did notice she published this herself, and maybe she was unable to get someone professional to go over this with a fine-tooth comb, but that still doesn’t excuse the errors. Thanks to NetGalley for the opportunity to read this book in exchange for this honest review. Disclosure: I received a copy of this book through a Goodreads giveaway. Basically this book is about a woman, who following the loss of her husband, decides to settle in fictitious Washington North Carolina and build an art gallery on the river. As she rebuilds her life, she finds romance but she also finds ghosts from the house's history. Reading the romance between Beth and Sam, I found myself rooting for them to continue to get to know each other. However something traumatic happens to Beth w Disclosure: I received a copy of this book through a Goodreads giveaway. This book left me quite conflicted. I enjoyed the story, but the fact that it's the first part of a three-part story is a little disappointing, because I'm not sure I can read another book in this style. The writing just doesn't do it for me. It lacks depth, in my opinion, and the love story is just a little too predictable, while the obsessions are also just a little too unrealistic. There are plenty of holes in the plot, and the editing leaves a lot to be desired. However, as I said, the basic This book left me quite conflicted. I enjoyed the story, but the fact that it's the first part of a three-part story is a little disappointing, because I'm not sure I can read another book in this style. The writing just doesn't do it for me. It lacks depth, in my opinion, and the love story is just a little too predictable, while the obsessions are also just a little too unrealistic. There are plenty of holes in the plot, and the editing leaves a lot to be desired. However, as I said, the basic storyline is good, and I'd like to see where the final twist of this instalment is heading. I'd like to know more about Selah's story, as well. To me, it needed more fleshing out, the characters needed more work and growth. The relationship between Sam and Beth (I almost forgot her name) felt forced and fabricated. The story itself was just everywhere and very predictable, from the first few chapters I knew how this would play out and I guessed right everytime. There was no mystery, no suspense, it was all very...stale and flat. Drenched Sunflowers by Tammy Cooper is a romantic thriller. This story has a ghost in it but its the friendliest and nicest ghost I’ve ever come across so far. Beth is a widow who comes to a small town to get away from his dead husband memories. She hires Sam to renovate the old building and convert it into an art gallery. They discover a basement from 18th century during the process. Beth starts seeing nightmares and a ghost. The ghost keeps warning Beth about the danger from someone but Beth i Drenched Sunflowers by Tammy Cooper is a romantic thriller. This story has a ghost in it but its the friendliest and nicest ghost I’ve ever come across so far. Beth is a widow who comes to a small town to get away from his dead husband memories. She hires Sam to renovate the old building and convert it into an art gallery. They discover a basement from 18th century during the process. Beth starts seeing nightmares and a ghost. The ghost keeps warning Beth about the danger from someone but Beth ignores. Beth starts liking Sam and they both go on a couple of dates. Beth feels very overwhelmed by the opening of the art gallery, nightmares and Sam. She gets kidnapped one day. The story has a wonderful twist about the kidnapper. The author maintains the suspense in an even tone all through the story and manages to keep a hold on the reader. I very much enjoyed this book and in fact started believing the existence of friendly ghosts after reading this novel. I found the romance and suspense in equal parts in the book. The details about the small town Washington, NC are beautifully described. The characters are also very well built. I was given this book for free to do an honest review. I enjoyed this book and its story, however at various points in the book the text was too stilted and it did not involve the reader to feel what the author wanted him/her to feel. The chemistry between the main characters was not clearly felt. Also, the story was too predictable with the twists in the story coming at no surprise. I would have also suggested a round of proofreading as there are some spelling and grammar mistakes. Some sentenc I was given this book for free to do an honest review. I received an Advanced Reader's Copy of this book from NetGalley in exchange for an honest review. It took a while for this book to capture my attention and make me want to finish it. When it did though - boy, did it! It kept me guessing right through the end. Even though there were themes of ghosts and such, it did not scare me.or keep me from reading it through the wee hours. Drenched Sunflowers is well written. Good plot and setting. Thanks to the publisher and Netgalley for my digital arc this is my unbiased review. To me, it needed more flessing out, the characters needed more work and growth. Falling in love with the characters is half the joy of reading a good story. Falling for the setting adds to that enjoyment. Tammera Cooper has done an excellent job of weaving antebellum Washington, North Carolina with the modern. The port city was active on the Underground Railroad. Her research is obvious in her reconstruction of the time period. As her modern heroine works to restore the house on Water Street, the history is brought to life. Beth and her contractor, Sam fall in love amidst t Falling in love with the characters is half the joy of reading a good story. Falling for the setting adds to that enjoyment. Tammera Cooper has done an excellent job of weaving antebellum Washington, North Carolina with the modern. The port city was active on the Underground Railroad. Her research is obvious in her reconstruction of the time period. As her modern heroine works to restore the house on Water Street, the history is brought to life. Beth and her contractor, Sam fall in love amidst the restoration and discovery of the house’s charms and nightmares. Drenched Sunflowers is rich in history, suspense and southern charm. If you are looking for a romantic suspense with a lot of intrigue and local flavor, you need to check out this book.